Most people love nothing more than snuggling into bed at the end of a long day. While your dog may seem happy to nap anywhere, most dogs love having their own comfy bed to snuggle into at the end of the day. In fact, choosing the right dog bed to suit your dog’s size, breed, and personality is one of the top tips on how to keep your pet happy. When you’re ready to choose a new dog bed, you may be surprised at the range of options available. Your dog may seem happy to curl up just about anywhere, but there will still be certain types of dog beds that will suit your dog better. Read on to find out about different styles of dog beds available, and important factors to consider when choosing the right dog bed for your dog. When choosing a dog bed, ask yourself the following questions about your dog. Your dog’s sleeping size often has very little to do with its actual breed size. Wait until your dog is asleep and carefully measure from the tip of its nose to the end of its tail. How much room is your dog taking up? It can often be the case that large dogs will curl up into a tight ball to sleep, taking very little room, while smaller dogs may spread out and dominate a much larger area. When choosing a dog bed, pay more attention to your dog’s sleeping size than their actual size. A large dog that chooses to curl up tightly while sleeping will be much more comfortable in a medium-sized dog bed. A small dog that likes to spread out, would probably choose a large bed over a smaller one. If your dog is a natural chewer or is still a puppy cutting their teeth, stick with a no-frills bed that is free from dangerous extras like bean bag fillings or sides that can be ripped off. Obsessive chewers may need little more than a mat or blanket on the ground. Wait until your dog outgrows their chewing tendencies before choosing a more elaborate bed style. 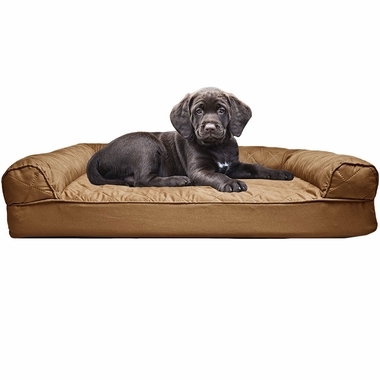 Consider your dog’s age, sensitivities, and any health or other special needs when choosing a dog bed. Older dogs or those suffering from arthritis could find it difficult to climb into a hammock bed. Dogs with long or thick fur could be most comfortable on a cooling pad during warm weather. Small dogs or dogs with little hair will feel warm and protected in a bed with raised edges, such as a round bed or bolster bed. If your elderly dog has problems with incontinence, a hammock bed will be the easiest to clean and most hygienic option. What’s your dog’s sleeping style? The easiest way to find this out is to observe them the next few times they fall asleep. You may be surprised to see that their body position tends to remain the same every time they sleep, no matter where they are. Your dog’s sleeping style is one of the most important factors to consider when deciding on the right style of dog bed for your pet. Consider the following four general sleeping styles for dogs and see which one applies most to your pooch. Also known as “the doughnut”, the hedgehog typically starts with a dog walking in a circle before lying down in a compact little ball. The hedgehog is a firm favorite with dogs who like to feel protected and safe, or who need to keep warm in cold weather. Dogs who sleep in the hedgehog position tend to prefer round beds and bolster beds. Choosing the right size bed is highly important for a hedgehog sleeper, as a bed that is too large won’t give the desired level of comfort and protection. The opposite of the hedgehog, a space-hog likes to take up as much space as possible while sleeping. Lying either on their stomach or on their side, space-hogs stretch out their legs in both directions and make it known to everyone that they are comfortable, relaxed, and in charge of their own sleep. 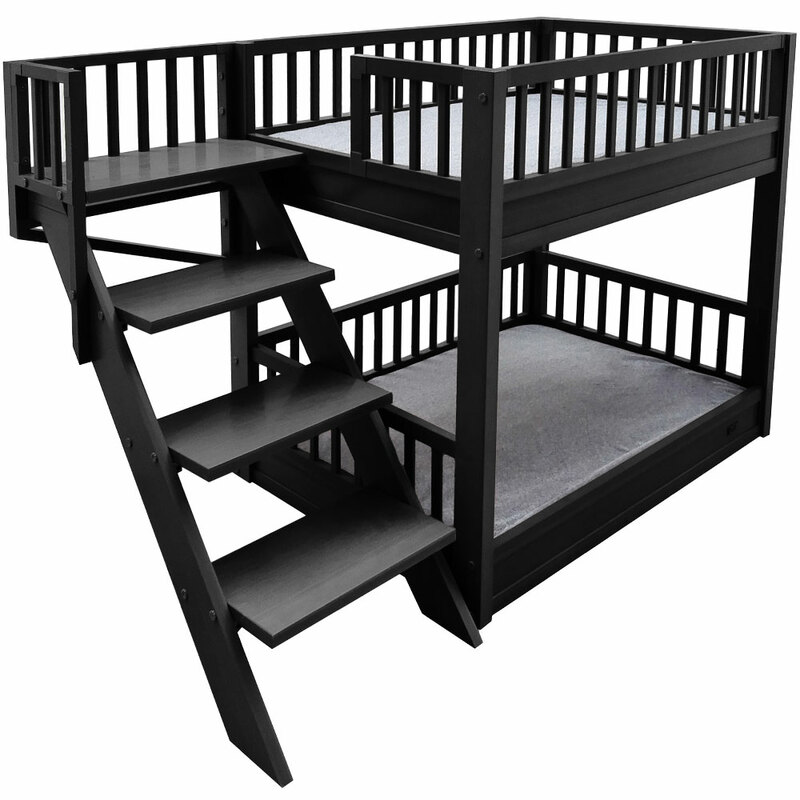 Space-hogs need plenty of room to move and don’t like structured beds like bolster beds and round beds. A pillow bed or mat will give your space-hog the most room to move. Dogs that sleep with their underside on display may be looking to cool off on a hot day. Or maybe simply feeling relaxed and confident in this highly vulnerable sleeping position. Dogs who sleep “wrong way up” tend to enjoy a padded bed that provides plenty of support for their spine, or a hammock bed that allows them to sink into their heart’s delight. If your dog flops down on one side every time they lie down to sleep, you’ve got a side-winder. These dogs will often try to position themselves, so their back is leaning against a solid surface, making bolster beds the dog bed of choice for a side-winder, with hammock beds a close second. Most human beds are generally similar with only slight variations in size, material, and colors. 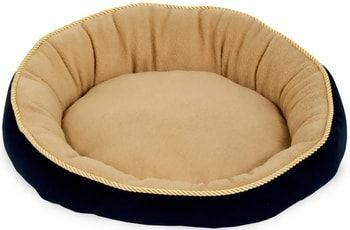 Dog beds, however, come in a number of distinctive styles to suit different types of dogs and different sleeping styles. Now that you know your dog’s individual sleeping style, you’re in a better position to choose the best type of dog bed for your dog. Mats and blankets are the simplest form of a dog bed. 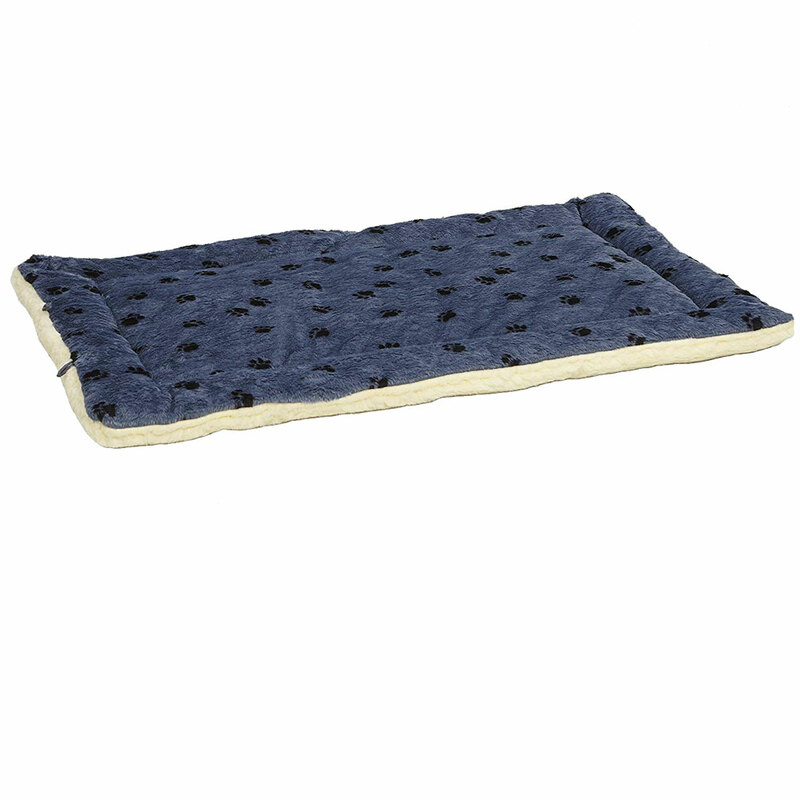 It can be an ideal choice for dogs who shun elaborate dog beds, preferring to sleep directly on the floor. A mat or blanket will provide a low level of warmth and comfort for floor sleepers. But it can also be used to protect fabrics and upholstery for dogs who are allowed to sleep on the couch or a human bed. Pillow beds and bean bag beds are ideal for dogs who tend to take up a lot of room while sleeping. Unlike hammock beds, pillows are low to the ground and can accommodate dogs who tend to “melt” off the side of their beds whilst sleeping. Bean bag styles will stay comfortable much longer than pillow styles, which will soon go flat after repeated use. However, if your dog can’t resist chewing, steer clear of bean bag filled beds at all costs. Round beds are soft, padded, and have raised edges to maintain their shape. Comfort and warmth are the primary benefits of round beds. It is important to choose the perfect size for your dog. See the “Sleeping Size” section above. Dogs who sleep on their sides or who like to lean, tend to love bolster beds. Bolster beds resemble small sofas and have tightly stuffed raised edges for leaning and resting against. Bolster beds can take up a fair amount of room. They can be difficult to clean unless they have a removable cover. Hammock beds are highly durable, easy to clean, and suitable for indoor or outdoor use. Consisting of a metal frame with a removable, washable cover, hammock beds come in a variety of sizes. Since they are elevated off the ground, hammock beds do not trap odors. But they can be difficult for infirm or arthritic dogs to access. You’ve now been able to narrow down your dog bed choices by studying your dog’s sleeping style and individual characteristics. Before you buy, keep in mind these other features to ensure the dog bed you choose will suit your family and your lifestyle. All dog beds start out fresh and clean, but it doesn’t take long before you’re dealing with dirt, odor, and dog hair. Do yourself a favor by choosing a dog bed that is easy to maintain and keep clean. Beds with removable covers are simpler to clean and cheaper to replace over time. An all-in-one dog bed without a removable cover may need to be completely replaced, if it can’t be adequately and deeply cleaned. Regardless of your dog’s preferences, you must always choose a dog bed that suits your home. If you don’t have the room for a large pillow bed or hammock bed, one option might be to allow your dog to sleep on the couch. Use a blanket or mat to protect your upholstery from potential damage. Alternatively, look for a folding bed that you can pack away during the day to save room. Buying the perfect bed for your dog is the right option if that bed also suits your home and family. Have you ever been on holiday or in a hotel and wished for nothing more than to be back at home in your own bed? Dogs are no different. Some dogs become so attached, that they will attempt to drag it around the house from one room to another. Give your dog the gift of comfort and a good night’s sleep by choosing the best bed to suit your dog. Dog Dementia: Spot the Warning Signs and Manage Your Mutt Successfully Bully Sticks: Are They Safe and Healthy For My Dog?